Make the dressing - combine all ingredients in a small bowl until the sugar dissolves. Spicy pesto - drop the garlic, scallion whites, and red pepper flakes down the feed tube of a food processor while the motor is running and chop finely. Open the bowl and add the basil leaves. Pulse, turning the machine on and off, then slowly pour the sesame and olive oil down the feed tube and chop the mixture to a fine paste. Add the lemon juice and soy sauce and continue blending until the mixture is a fairly smooth paste. Salad - bring 3 quarts of water to a boil in a large pot. Add the snow peas and cook for 30 seconds. Remove with a large slotted spoon and drain in a strainer or colander under cold running water. Bring the water to a boil again and add the soba noodles. Once the water boils again, cook for 3-1/2 minutes, or until al dente. Drain in a colander and rinse the noodles under warm running water. Drain again. 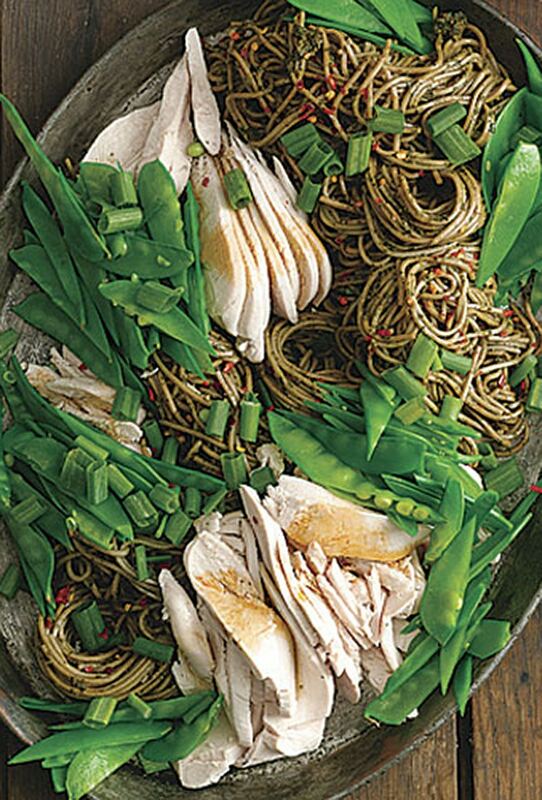 In a large mixing bowl, toss the cooked soba noodles with the pesto mixture. Arrange in a large shallow bowl or platter. Sprinkle the snap peas evenly over the noodles, followed by the julienned chicken, and finishing with the scallion greens. Serve the dressing on the side in a sauce bowl, or drizzle over the salad. Serve at room temperature or chilled. Substitute cooked shrimp, pork, or flavored tofu for the chicken. You can also replace the snow or snap peas with 2-1/2 cups shredded carrots, bean sprouts, or other sliced vegetables.